Real Pic Simulator is a Microchip PIC microcontroller simulator capable of real-time simulation. An integrated disassembler allows examining and exporting the code to assembler code. Debugger allows execution of the program in real-time, at selected speed or step-by-step, using breakpoints. RAM and EEPROM viewer allows the user to inspect RAM and EEPROM memory content. 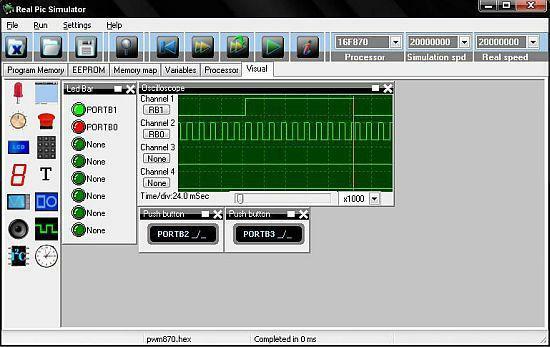 Processor viewer allows users to view the microcontroller’s pin allocation and characteristics. Visual simulator enables visual simulation of the program with visual components (LEDs and Keypads). Fiz uma compilação no MikroC de um pic16f877, gerei o .hex, testei no real pic simulator e funcionou. Coloquei no ISIS (Proteus) e os bits das portas que setei como entrada não funcionaram mais. Mas até aqui no gringos tu ta metido ! Rsss, aqui também é interessante!